June 23, 2011: Drafted in the second round of the 2011 NBA Draft (31st overall) by the Miami Heat… Traded twice on draft night, first to the Minnesota Timberwolves in exchange for Norris Cole and then to the Nets in exchange for Brooklyn’s 2013 second round pick and cash considerations… July 7, 2014: Signed a multi-year contract with the Brooklyn Nets. In 160 career games for Fenerbahçe Ülker of the Turkish Basketball League, averaged 13.7 points, 2.3 rebounds and 1.8 assists in 26.0 minutes per game over 118 starts. 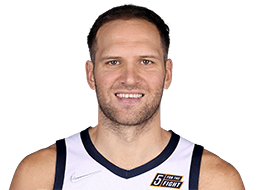 2011-12 (Fenerbahçe Ülker): Started 25 of 48 games, averaging 13.4 points, 2.3 rebounds and 1.4 assists in 23.5 minutes per game… Averaged 13.0 points and 2.2 rebounds in 16 Euroleague games… Played 32 Turkish League games, averaging 13.6 points, 2.4 rebounds and 1.8 assists per game.